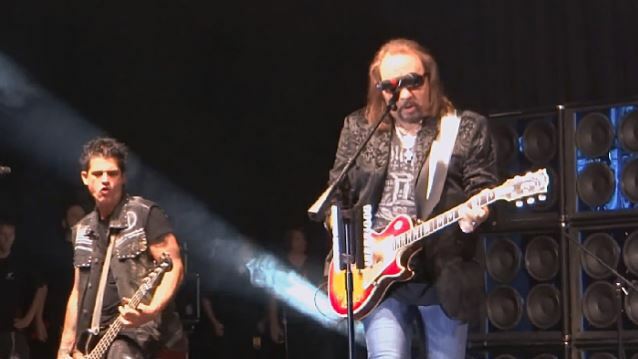 SROMaginc.com recently conducted an interview with former ACE FREHLEY bassist Anthony Esposito. You can now listen to the chat in the YouTube clip below. A couple of excerpts follow (transcribed by BLABBERMOUTH.NET). Esposito: "It started out really amazing, really great. We were really good friends, close friends. [We did] everything from riding Harleys together to going to Yankee games and stuff like that, just hanging out, being bros kind of thing. And we started working on the music for [2009's] 'Anomaly' [album], and then I put a band together for him and did a few gigs. And then we decided to record 'Anomaly'. And we were really, really close friends, and it was great working with him. He's a very talented guitar player and great songwriter. But over a period of time, different people come in and out of the circle, and so it kind of got stretched and twisted. But he was a really close friend of mine for a while." "When I met him, I think I had 14 years or sobriety, or 13 years of sobriety, and so a lot of it was based on [the fact that] he wanted to quit drinking at that time. So I guess he [needed] a good influence to put him on that path. But he did a lot of it on his own. He was pretty adamant about quitting." "I just got asked to [make an appearance] September 13 at the KISS convention in New Jersey, so I'm bringing all of my [road gear and personal merchandise collection] and I'm just gonna sell it all off. Really, the way it ended left a bad taste in my mouth and I just wanna get rid of it. I feel kind of dissed. [But] what are you gonna do? It is what it is." Esposito: "No. A lot of things would have to change before I went back, and don't think they're gonna change, so I'm not interested in going back. The whole thing is, I tried to make the whole thing a pro organization with the selection of musicians and the way that every penny was accounted for. I appreciate that he trusted me to do all that, and I accounted for every penny, I accounted for everything."